Brehanna Daniels has broken down a barrier in a sport that is not usually associated with African Americans or women. She is a pit crew member, a tire changer, affiliated with NASCAR Racing. Daniels was born on January 26, 1994, along with her twin brother Brehon, to Luxley Daniels and the late Kimberly Daniels. Daniels was raised in Virginia Beach, Virginia, attended the local elementary school and graduated from Salem High School in 2012, where she was an avid basketball player. Shortly after she began attending Norfolk State University and was a Point and Shooting Guard for the school. 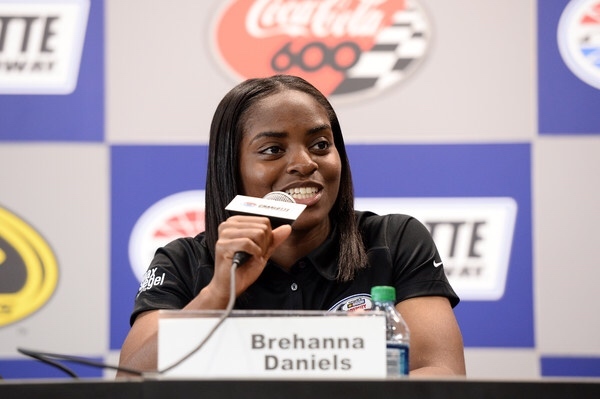 In 2016, Daniels found herself about to graduate from college and was contemplating playing basketball overseas, when she was approached by a woman representing NASCAR racing. Daniels was invited to participate in the NASCAR Drive for Diversity Pit Crew Development Program. This training program is geared toward people of color of both genders, exposing them to the evolving world of NASCAR Racing. After watching a video of what a NASCAR pit crew member actually does, Daniels decided to attend the event. NASCAR pit crew coach Phil Horton required all the attendees, including Daniels, the only woman in the group, to run through a tough obstacle course. Daniels performed much better than expected, beating many of her male counterparts in the course. Three weeks later she was invited to a Nascar Pit Crew Combine, a competition in which she placed in the top ten and was accepted into the program. All trainees were required to attend performance workouts twice a day for the first six months period. Her hard work paid off in her very first race. In 2017, Daniels was put to the test during an ARCA race, in Nashville, Tennessee. She was “on the wall,” a spot where pit crew members that are unassigned to a team, assist drivers that are also not sponsored yet. When the car drove into the pit, Daniels at 5’5, jumped over the short wall with a tire and an impact wrench, and quickly changed a rear tire of the racing vehicle. At the Dover International Speedway race held in June, 2017 in Dover, Delaware, Daniels became the first African American woman to pit a vehicle in a national NASCAR series race. Daniels changed tires in the ARCA, Xfinity, and Camping World Truck series. During the Daytona 500 in February of 2018, Daniels worked for driver Stephen Leicht, and has been working with JP Motorsports. Daniels aspires to one day be a part of a NASCAR Cup winning team. Brianna Mone, “Meet NASCAR's First Black Woman Pit Crew Member,” Teenvogue.com, February 28, 2016, https://www.teenvogue.com/story/brehanna-daniels-nascar-pit-crew-interview; Deb Williams, “Brehanna Daniels goes over the wall and into NASCAR history books,” ESPN.com, June 7, 2017, http://www.espn.com/espnw/sports/article/19563800/nascar-drive-diversity-brehanna-daniels-makes-history-going-wall. Brianna Mone, “Meet NASCAR’s First Black Woman Pit Crew Member,” Teenvogue.com, February 28, 2016, https://www.teenvogue.com/story/brehanna-daniels-nascar-pit-crew-interview; Deb Williams, “Brehanna Daniels goes over the wall and into NASCAR history books,” ESPN.com, June 7, 2017, http://www.espn.com/espnw/sports/article/19563800/nascar-drive-diversity-brehanna-daniels-makes-history-going-wall.